Soarin’ Around the World debuted today at Epcot and we were on the first flight! If you don’t want the ride to be spoiled, just know that it is a wonderful upgrade to the ride with vast scenes and wonderful, new scents. It’s a very logical and worthy upgrade to an already enjoyable ride. Everything after this will contain SPOILERS. 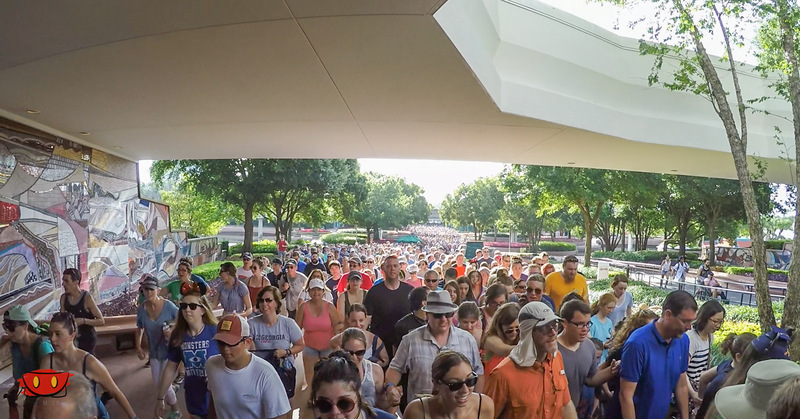 First, some looks at the crowd levels walking up to the Land Pavilion. As you can see, there were huge crowds rope-dropping in anticipation of the new film. The most important thing you need to know is that Patrick Warburton hasn’t gone anywhere! The same safety spiel that we all know and love hasn’t changed. So what has changed? The queue now features a trivia game of sorts that allows you to compete against other guests in a test of your worldly knowledge. As we were the first flight out, we didn’t get to stop and play, but it seems to have been well received. Like we said, the safety spiel hasn’t changed, but the locations that are displayed obviously have. Instead of locations from California you’ll now get… you guessed it…. locations from around the world that you’ll be visiting shortly. Matterhorn – First up is the Matterhorn/Swiss Alps. It’s a beautiful opening scene that gets you in the mood to soar over the rest of the world. You fly up and over the top of the mountain before entering a cloud to transition to the next scene. Glaciers – We next find ourselves amongst polar bears and orcas as we fly over a glacier scene. The polar bears dive off of icebergs as we fly a bit too close to them. An orca then jumps in front of us and causes a giant splash that is used as a transition to the next scene. Note that there are no water effects with the splash. Sydney Harbor – We are now flying over sailboats in the Sydney Harbor in Australia. As we pass the Sydney Opera House a seaplane takes off in front of us and we transition to the next scene. Neuschwanstein Castle – Our next stop is the iconic Neuschwanstein Castle. As an aside, the castle has served as inspiration for Disneyland’s Sleeping Beauty Castle. A lens flare serves as the transition for this scene. African Savana – We next find ourselves soaring over elephants on the African Savana. This is the first time a scent is introduced to the ride. The smell of fresh grass serves, in my opinion, as Soarin Around the World’s orange scent. It puts me right in the scene and is instantly identifiable. Dirt thrown by an elephant is the transition piece for this scene. The Great Wall of China – We then fly low over The Great Wall of China, seemingly just missing people walking. A kite flys in front of us for the transition effect. Pyramids – We fly past sand dunes and camels before banking towards the Pyramids. Once again, a dust cloud serves as the transition. Taj Mahal – We approach the Taj Mahal while flying over the same reflecting pool that is depicted in it’s a small world. A scent of flowers/perfume is applied in this scene. We climb up and over the dome as it transitions into a hot air balloon for the next scene. Monument Valley – We’re now flying amongst hot air balloons in Monument Valley. Three hot air balloons form a hidden Mickey. A bird flying at the screen is the transition for this scene. Fiji – A simple beach scene where we enjoy a leisurely flight over blue water. There is another smell piped in here, but I didn’t really identify it outside of a fresh outdoors-type smell. It seemed similar to the ocean smell in the last version of the ride. This serves as the smoothest transition as we go from water to water. Iguazu Falls – We quickly approach the crest of the waterfall and soar over it. We bank slightly towards mist created by the falls into the next scene. Eiffel Tower – Our first night scene is the Eiffel Tower in Paris. As we approach the tower, we encounter our most pronounced bank in the entire ride. We shoot straight up the tower to the top and fly into the spotlights as a transition. I wouldn’t say that the bank is severe enough to discourage anyone from riding, but it’s the most pronounced shifting of the seats in either Soarin Over California or Soarin Around the World. Epcot – The last scene is us returning home to Epcot at night. We approach from World Showcase and fly over the Fountain of Nations towards Spaceship Earth. A monorail passes beneath us and fireworks shoot off to signal the end of the ride. Overall, I felt that this was a great upgrade to Soarin. It includes more well-known locations and some beautiful scenery. As this is a Disney blog, we have to find something to complain about. My only complaint was the seemingly heavy reliance on CGI. I believe that the entire Taj Mahal scene is CGI due to very strict no-fly rules. Another point of complaint that I’ve read is that of the transition effects. Some of them are much “softer” than others and thus enjoyable, but some are pretty harsh like flying under a sea plane or being attacked by a bird. All that said, the third theater should keep waits under 60 minutes for most of the summer and I would gladly ride it with someone who hasn’t experienced the ride if it is 60 minutes or less. For comparison, I wouldn’t suggest Soarin’ 1.0 if it had more than a 30 minute wait. If you have any questions or comments please leave them below or hit us up on social media! Thanks for reading.